Finn Park, Ballybofey - the scene of the feisty north west derby between Finn Harps and Derry City on Friday night. IT’S A real shame Friday night’s typically tense and eventful North West derby was overshadowed by an x-rated tackle on Ciaran Coll as the bad blood between the teams spilled over. Finn Harps boss, Ollie Horgan predicted the match would be a ‘savage battle’ in his programme notes but some of the shameful behaviour has left a bad taste in the mouth of many of those involved and I’m sure the majority of the 2,228 attendance. The defender, who had been enjoying an impressive start to the game, was the victim of an horrendous tackle from Harps defender, Colm Deasy who was nowhere near the ball with a tackle that deserves a lengthy ban. 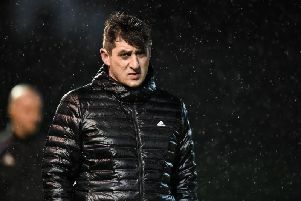 Coll’s comments prior to the match about how he would gladly take the verbal abuse from the stands in return for three points for Derry, will surely have incensed the Harps’ supporters and will likely have provided Horgan and Paul Hegarty with a ready-made team-talk. Horgan himself made reference to the same ‘Journal’ article in his post-match interview when he said Derry City celebrated their win like it was a cup final, so it was certainly playing on the minds of those in the Harps’ camp. However, no matter how much one stoked the flames prior to kick-off, there’s no place for such a reckless, ill-judged tackle which had the potential to cause a career-threatening injury and the FAI must now throw the book at Deasy for what was a moment of madness. Intent can never be proven, but it matters little. Take a look at the footage doing the rounds on social media, or on RTE’s Soccer Republic show and make your own mind up. Hopefully, Horgan has had the chance to see it back as he claimed he couldn’t comment after the game because the tackle occurred on the opposite side of the pitch to the dugout and it might be some small consolation if Deasy did the right thing and publicly apologised to Coll who made 270 appearances for Harps during his 10 year service. If Jamie McDonagh and Mickey Drennan were deserving of four and three match bans for dissent due to the FAI’s clamp down, then surely another lengthy ban must be considered for Deasy’s crunching tackle which fashioned a ‘straight red’ on the night from one of the best referees in the league in Neil Doyle. The incident happened right below the Press Box at Finn Park, right in front of the travelling Derry fans and one could hear the ferocity of the tackle. Coll rolled around writhing in agony for eight minutes as City physio. Michael Hegarty treated him before he was stretchered off to be taken to hospital by the ambulance on stand-by. Thankfully leg break fears were allayed following an X-ray but Coll could still face a lengthy period on the sidelines if there’s ligament damage which will be hugely frustrating for the experienced defender who has been a steady performer since making his debut at Turner’s Cross last month. Both sets of fans were passionate to say the least on Friday night, but for certain sections of the Harps support to sarcastically cheer and jeer Coll as he lay on a stretcher, was appalling and quite rightly criticised by Derry boss, Declan Devine afterwards. Tensions were heightened on the night, however, those Harps fans crossed the line at that point with their regrettable behaviour while there was a skirmish in the crowd as a small number of City fans clashed with rival supporters in the area behind the goal. It must be said though, it was a minority of so-called fans, with many well wishes expressed by Finn Harps’ supporters after the match on social media. The behaviour of Derry City players and staff was also criticised by Harps’ representatives after the match for the passionate celebrations with their supporters - which I felt was refreshing to see - but particularly for the state they left the away dressing rooms in. Pictures circulated afterwards of the contents of a bin spread across the changing room floor which was hardly the classy behaviour we’d expect and while I wouldn’t condone it, you can see how emotions were running high after that despicable tackle on Coll. Two players who have represented both clubs and played for both sides in several derby matches, Kevin McHugh and Paddy McCourt, had an exchange on Twitter following the match with both agreeing those unsavoury incidents were regrettable. “Emotions can get the better of people in derbies and I can understand alot [sic] of nonsense before/after games, but for the Derry management to purposely leave that mess speaks volumes for their maturity levels,” said ex-City and Harps striker, McHugh. Sadly the first derby of the season has been marred by a nasty tackle and poor behaviour. Let’s hope after the next one at Brandywell on May 24 and another on May 27, we’ll be talking about the football and nothing else.